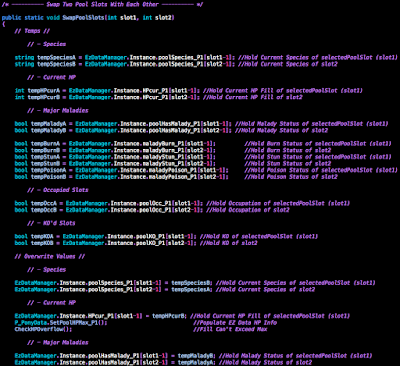 Now I'm using all kinds of visual tricks to make sense of the thousands of lines of code I quickly scroll through. 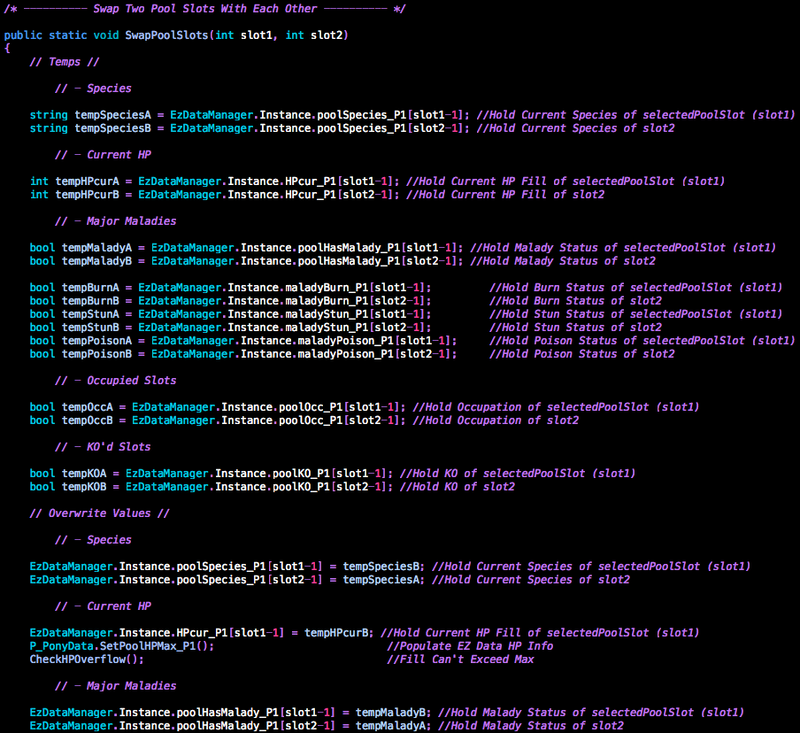 Big purple lines and comments everywhere draw my eye to quickly read what a particular piece of code does. Big green bookmarks help me keep track of different sections of similar functions. 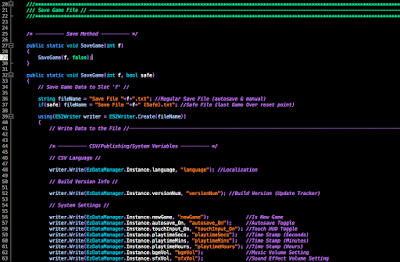 And little purple headers above each function helps my eyes hone in on each one too, whereas before I'd scrunch related ones as close together as possible. 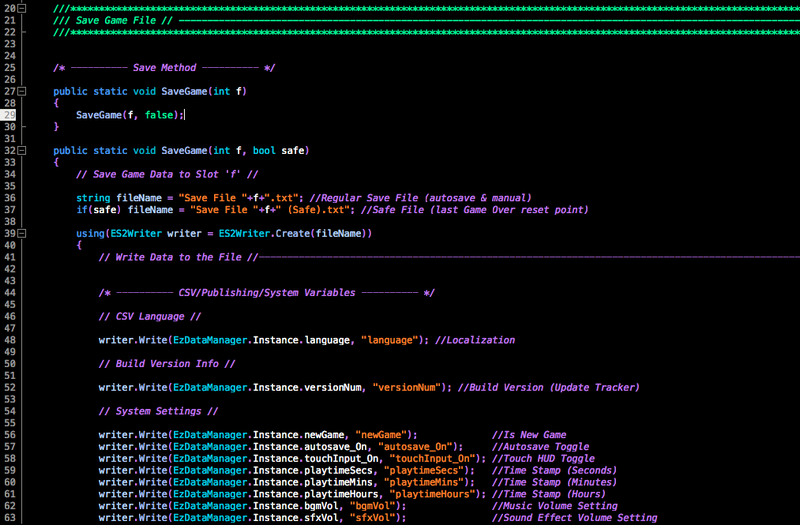 The philosophy now is to not be afraid to space things out, name variables clearly, and comment EVERYTHING. No more getting lost. No more forgetting what something does. The mobile gaming platform continues to be an embarrassment. This is why gamer's look disgusted when you tell them you're working on a mobile game. 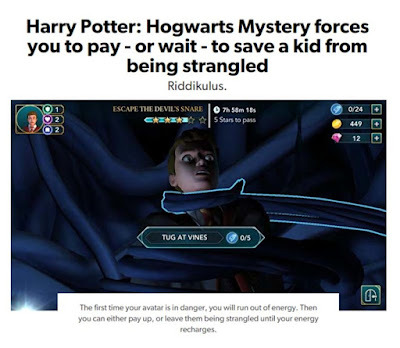 The whole Harry Potter Mobile Game fiasco really depresses me as a dev. But it does make me that much more sure that a game like BGP has to exist to show people how it's done. 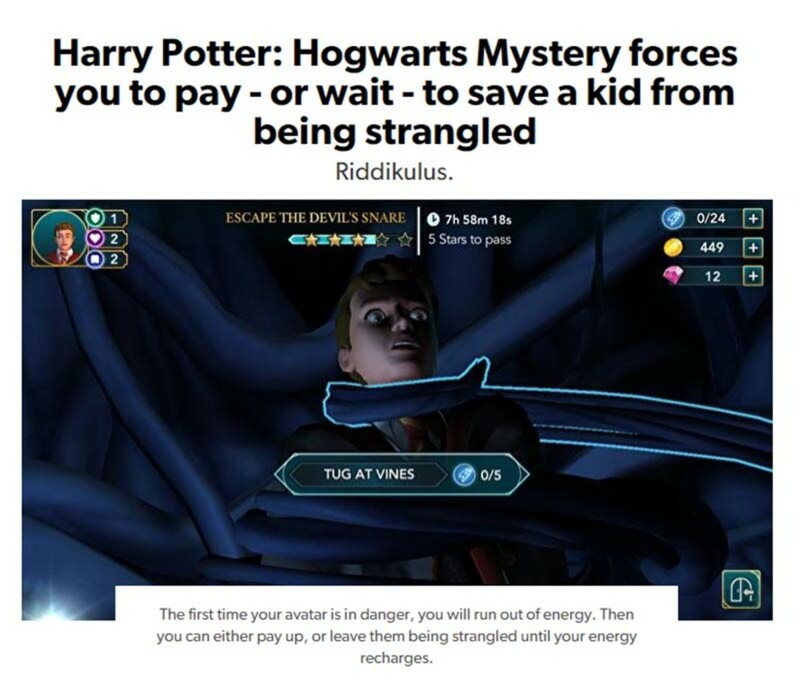 A game that charges upfront then lets you have fun for as long as you want. I'm really tired of seeing games with great potential die right before my eyes because of corporate greed. Found this interesting article by the Web Master at Seribii talking about What Pokemon's Main Series Can Learn from GO. Designs I intend to implement in BGP look a lot like what that article talks about so I'm reconfirmed not to be the only one seeking a game like this. I'd really like to implement a more fun capture mechanic like Pokemon GO's addictive ball toss, but I'll have to experiment with that stuff as well as online connectivity and timed special events in the sequel. There's a lot of Polish Touches for me to put on BGP, but I need to keep pushing them back. It's function over form at the moment and I need a game that works right now. Perfection comes later. 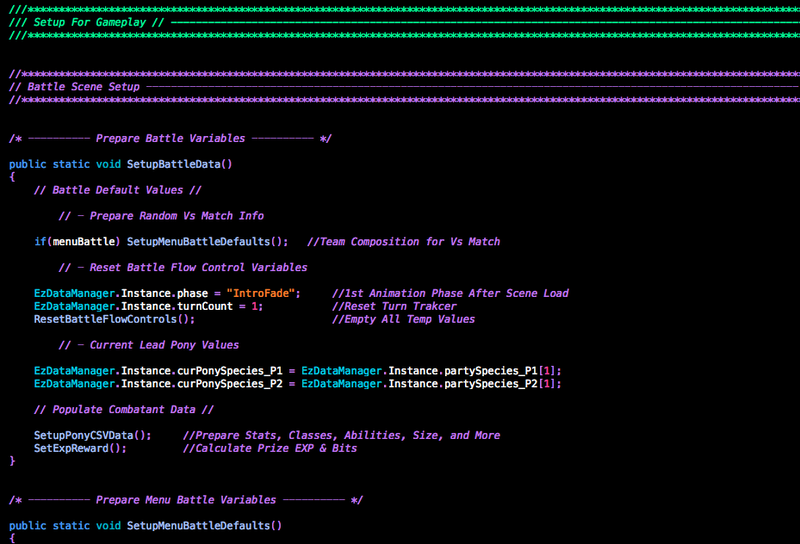 I might not have time to make the Battle AI as advanced as I want to, but I can lay a foundation to expand on later with DLC difficulty settings. 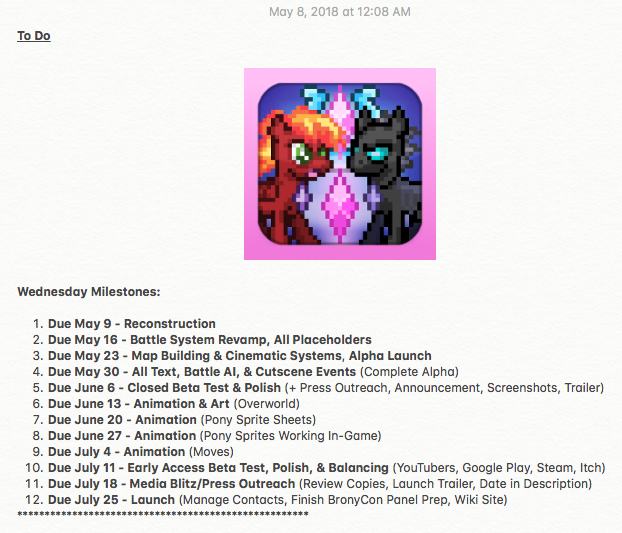 Revised schedule of what must be done to get this game out in time for BronyCon. Looking at the state of things right now I feel like the To Do schedule is feasible enough. Spend the next week continuing what I'm doing now with remaking all interfaces, basic combat, and making sure there's a stand-in for anything I'll be adding later. After that, I'll need to remake the overworld systems (cleaning up & copying over the working bits of that code I've already done) and convert my graph paper maps to Unity Tile Maps. 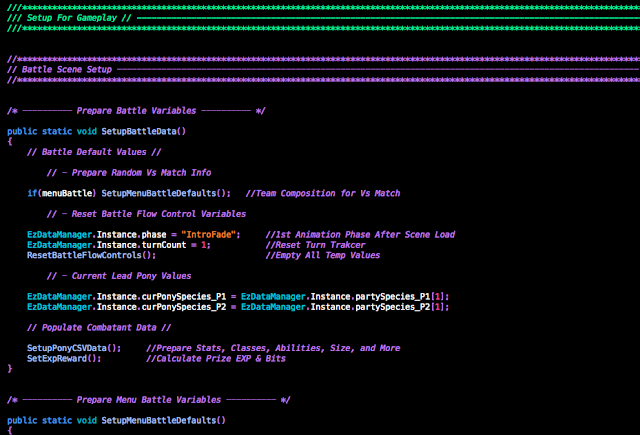 After that it's just polishing up a presentable demo, then drawing sprites and testing the game for a couple months. The key to getting all those art assets done in time is ignoring perfection until the very last step. I need rough sprites for everything, then cleaned up versions and in-between frames. Once that's all done, I can go back and tweak things with however much time is left. Main objective here is: If you can tell what it is, that's good enough for now. Sprites have caused major delays for me in the past, and it's mostly because I spend half the time staring at the thing wondering what details are missing or debating between 2 or 3 options for 10 minutes at a time. Gotta speed this up. Saw this email on Monday and submitted the Info Form ASAP with a revised version of the panel description. If I can reach the Alpha build by June, I'll definitely shoot them another email saying how close the game is to release. 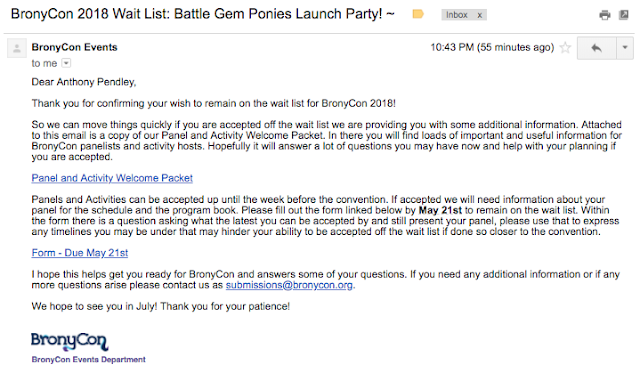 If it gets enough buzz just before BronyCon starts, and I let them know it comes out on the first day of the convention, I might find myself off the waitlist sooner rather than later. 10 of his hard-earned dollars every month over PayPal since 2015. Monthly reminder that these are the MVPs keeping the Yotes Games fire alive! 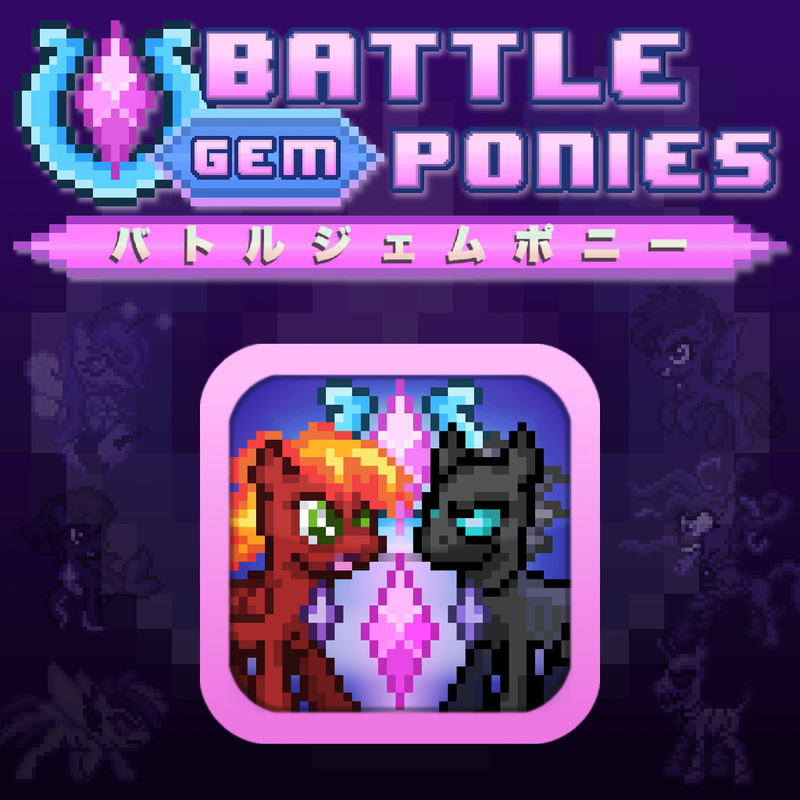 Battle Gem Ponies is looking better than ever because of you patrons giving me a budget to dedicate towards tools and assets to make development a lot easier (and faster too). Can't wait to put your tribute characters into the game and see your reactions! As a side note, think I should stop sharing my download number estimates and just celebrate noteworthy milestones as they come. It seems like sales data is just a privacy issue and doesn't do much beside make people want to guess exactly how much money you have at any given time or make judgements on investing in you or not. I can accomplish my goals of letting you know if I ever achieve success or not my just showing the obvious rankings and major milestones. Keeping track of all the sales numbers is interesting and all, but the methods I use to track em are falling off one by one because companies all seem to be saying sharing exact sales figures is a bad idea. But if you're curious about a vague estimation of how I'm doing so far, over 150,000 people have downloaded and played an app I've made. I've collected about $2,200 total since 2013 from my first game Unicorn Training (pretty much all went towards getting a Macbook to port to iOS where I failed to get the money back). Nowadays I dream about convincing those 150,000 people to pay $5 each for Battle Gem Ponies and just being set to start a life and make BGP2 with nothing holding me back. Racing towards this game's alpha build feels like the longest marathon of my life. I just pray the uphill part is over soon. Morale would go through the roof if I could just get to the point where all the systems are in place, just ready to be molded into a fun adventure.